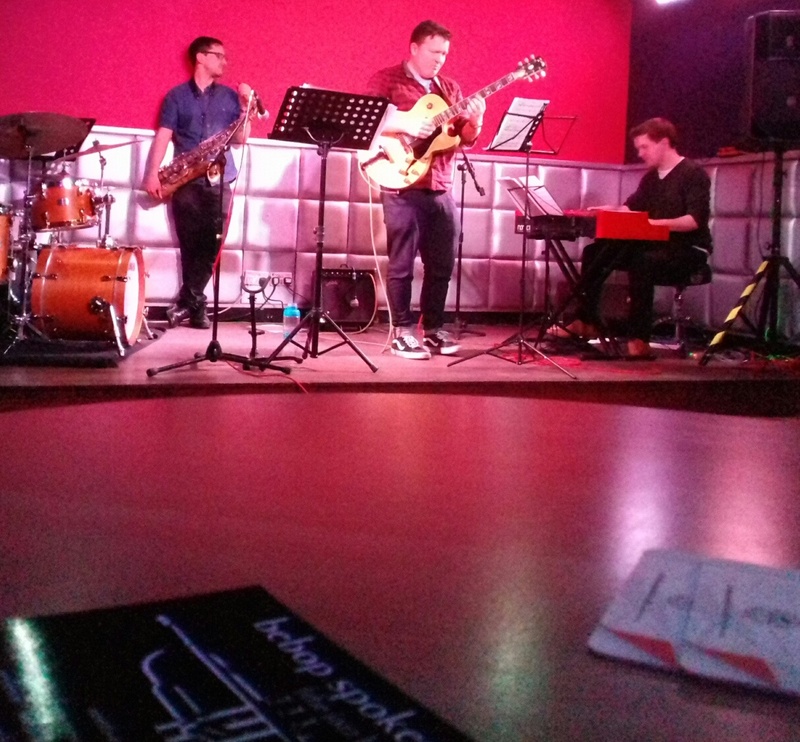 Sam Dunn (guitar); Nadim Teimoori (tenor); Martin Longhawn (organ); Tim Carter (drums). I wasn't sure what to expect. A youngish band, Leeds graduates, a boring evening of 'originals'? The name gave no clues, it could have meant anything. As it turned out, it was the first 2 letters of their surname stuck together. Still, what's in a name? In for a penny, in for a pound, or to be more precise - £10. It was worth it! 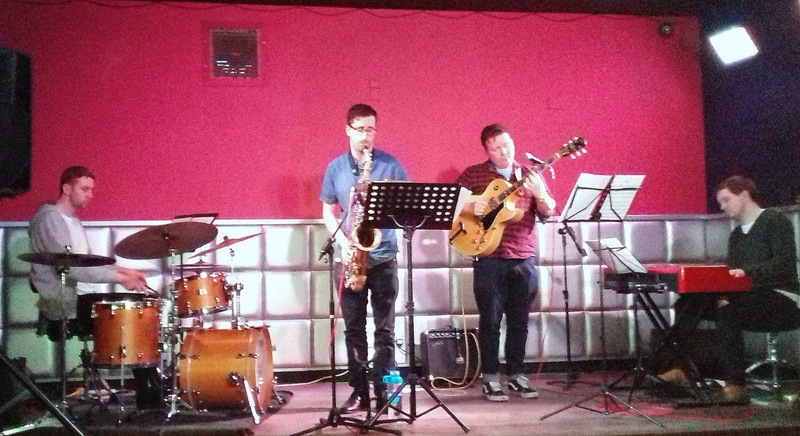 Four excellent musicians laying down a groove that may have had its origins in hard-bop but was now in the 21st century. Tenor player Teimoori graduated with a First from the Royal Academy of Music which didn't appear to have done him any harm at all judging by the storm he blew up on the opener - a piece by drummer Carter titled Tain. 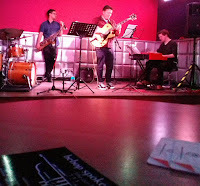 After the tenor solo, I was sure I had misheard and it was called Trane. Wow! and this was the first number. Not that it was a one-man show. Dunn's suggestion of a kiss curl forelock likened him to old photos of Bill Haley. Fortunately, his playing owed nothing to Bill Haley! He dug in deep playing licks and chords that Haley never dreamt existed. Carter drove them on and Longhawn proved that it is possible to be subtle on organ - no forearm smashes from Martin. The program varied with Monk's Four in One, a beautiful version of Darn That Dream with a rhapsodic intro from Dunn and an emotive solo from Teimoori. The set closed with a Sam Dunn composition titled (I think) Kill More Trout. Sam was also responsible for a contrafact which in this case laid a new melody on the chord sequence of I Should Care which he called I Don't Care! Tim Carter provided another original, a moody piece he named In the Quiet. The quiet didn't last long! Next number was - wait for it - Tico Tico. An incredible version that was fast even by samba standards. Carter set it off only slightly slower than the speed of light before tenor and guitar played the head in unison. The speed and the precision of the two horns (guitar was a horn for this chorus) made it sound like a bop tune such as Anthropology! Bertie's Boot, named after a dog in a recording studio in Leeds (shades of Nipper the old HMV dog), saw Martin Longhawn lose his reserve for a memorable blast. And then it was over with my adrenaline levels at a high! The inevitable encore brought them down a bit. A somewhat sedate, almost tongue in cheek, rendition of I'll be Seeing You which sort of grew upon you - very nice guitar intro. A great gig but, in an age when every band just happens to have a CD for sale (of which we are usually reminded every 32 bars) tonight, on the one night when you really wanted one there wasn't any! CD to be made later in the year, after catching up on a few months of sleep!